MAPS™ GSM A Interface Emulator Software Ver 7.11.9 (64-bit Only) | Download Now! GSM is a globally accepted standard for digital cellular communications. GSM stands for Global System for Mobile Communication and is an open, digital cellular technology used for transmitting mobile voice and data services. A GSM network is made up of multiple functional entities and interfaces that facilitate sending and receiving of signaling and traffic messages. It is a collection of transceivers, controllers, switches, routers, and registers. The MS and the BSS communicate across the Um interface, also known as the air interface or radio link. BTS and BSC will communicate across A-bis interface and The BSS communicates with the Network Service Switching center across the A interface. At the MSC, the information is mapped across the A interface to the MTP Layers 1 through 3 from the BSC. Here the equivalent set of radio resources is called the BSS MAP. The BSS MAP/DTAP and the MM and CM are at the upper layers of Layer 3 protocols. This completes the relay process. Through the control-signaling network, the MSCs interact to locate and connect to users throughout the network. Location registers are included in the MSC databases to assist in the role of determining how and whether connections are to be made to roaming users. 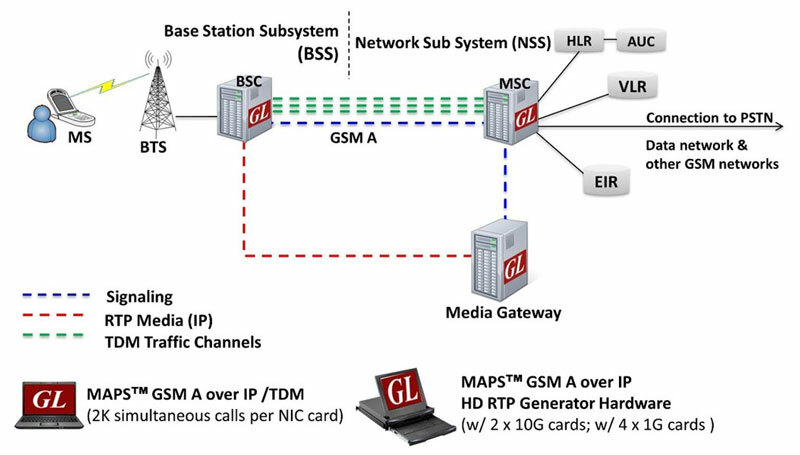 GL’s MAPS™ GSM A Emulator is an advanced protocol simulator/tester for GSM simulation over A Interface that can simulate MSC and BSC network elements for exchanging BSSMAP and DTAP messages as defined by 3GPP standards. The tester supports Error tracking, regression testing, conformance testing, load testing/call generation and generation of high volumes of GSM traffic over TDM as well as IP interface. It is able to run pre-defined test scenarios against GSM A interface test objects in a controlled & deterministic manner. With the purchase of RTP licenses (PKS102, PKS108), MAPS™ GSM A IP supports CS Domain RTP traffic such as –Tx Rx File, Tones, Digits, FAX, User-defined traffic, IVR, Loopback and VQT. With the purchase of RTP Core license (PKS102), MAPS™ GSM A supports transmission and detection of various RTP traffic such as, digits, voice file, single tone, dual tones, IVR, FAX*, Video*, and VQT*. With regular RTP traffic, the maximum Simultaneous Calls up to 2500, and Calls per Second up to 250 is achievable. Almost all industry standard voice codec supported. MAPS™ GSM A IP supports mobility management procedures over GSM A interface such as Location Management Procedure, Mobile Originating and Terminating Procedures, and Handover Management Procedures. 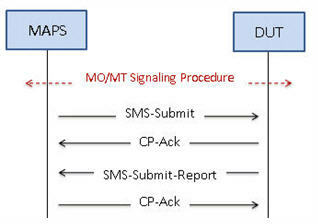 It supports send/receive SMS simultaneously using signaling channel with the voice/data/fax services over a GSM network. GSM A Interface Emulator supports powerful utilities like Message Editor, Script Editor and Profile Editor which allow custom call scenarios to be created or existing scenarios to be modified. With the purchase of TDM traffic licenses (xx610, xx620, xxFT0) GSM traffic can be simulated over T1/E1 interfaces. Supported traffic includes transmission and detection of digits, voice files, single tone, dual tones, FAX, Dynamic VF, User defined Traffic, IVR, and VQT. By mimicking real-world customer behavior in lab environments, our solutions allow mobile operators and equipment manufacturers to verify their wireless networks before deployment. In other words, one can setup a virtual real-time network simulating all the network elements using “MAPS 2G Wireless Lab Suite”. 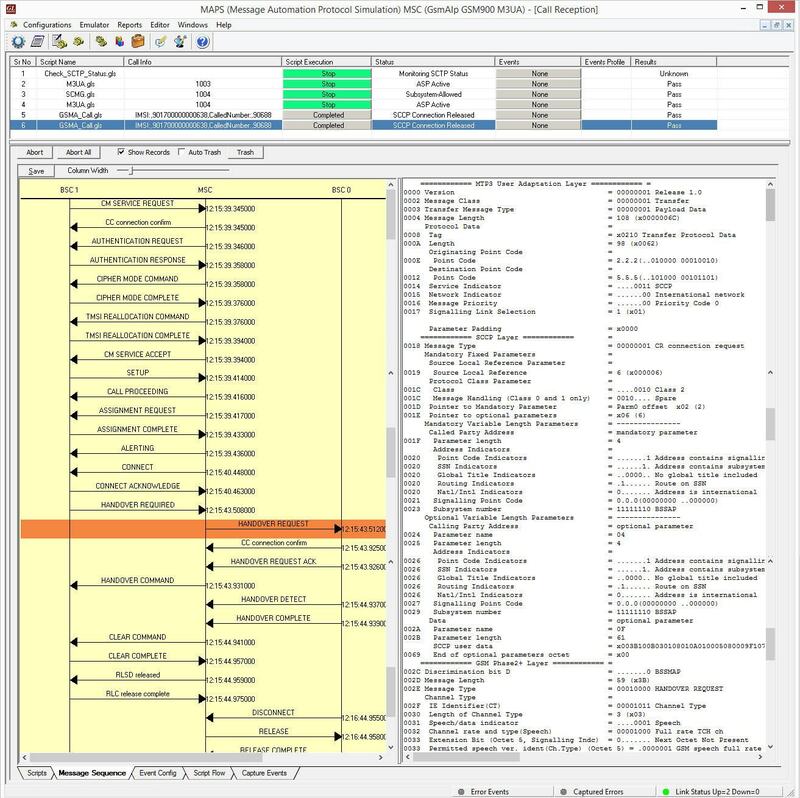 The test suite supports simulation of GSM Abis, GSM A, C/D/E, Gb, and GnGp interfaces. MAPS™ GSM A IP is also available in High Density version (requires a special purpose network appliance and PKS109 RTP HD licenses). This is capable of high call intensity (hundreds of calls/sec) and high volume of sustained calls (tens of thousands of simultaneous calls/platform). Supported codec types include G.711, G.729, G.726, GSM, AMR, EVRC, SMV, iLBC, SPEEX, G.722, and more. *AMR, EVRC variants requires additional licenses. Multi homing with multiple IP address configuration for single node is supported to keep the SCTP link continuously active between the connected nodes. The MAPS™ GSM A can also act as Base Station Controller (BSC) initiating the Location Updating Call procedure by sending Location Updating Request to the Network (MSC). The DUT on receipt of a LOCATION UPDATING REQUEST message sends a CC connection confirm message in response as shown in the figure below. Also, simulates the complete call flow as in typical Location Updating Call (MOC) procedure. MAPS™ GSM A acts as Base Station Controller (BSC) and initiates the Mobile Originating Call procedure by sending CM Service Request to the DUT (MSC). The DUT on receipt of a CM SERVICE REQUEST message should send a CC connection confirm message in response as shown in the figure below. Also, simulates the complete call flow as in typical Mobile Originating Call (MOC) procedure. MAPS™ GSM A acts as Mobile Station Controller (MSC) processing the call flow by initiating the Paging message to from the Mobile Station (BSC). The DUT (BSC) on receipt of a Paging message, sends a Paging Response message back to MSC. 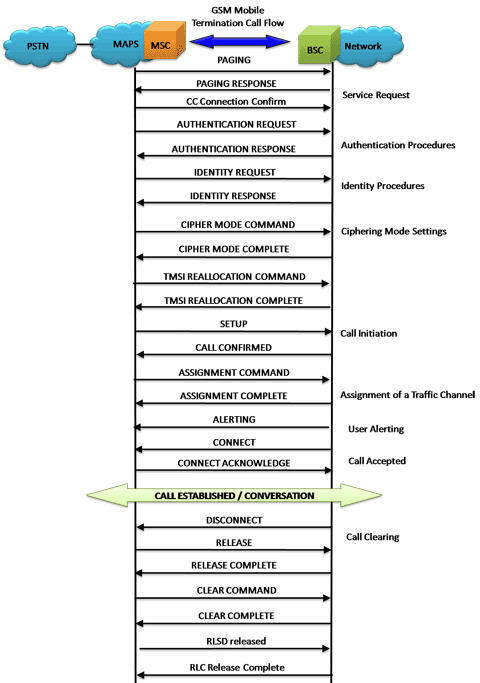 Also, simulates the complete call flow as in typical Mobile Terminating Call (MTC) procedure. When a mobile user travels across two different cell coverage areas within an active call duration, the call is transferred to the new cell’s base station. 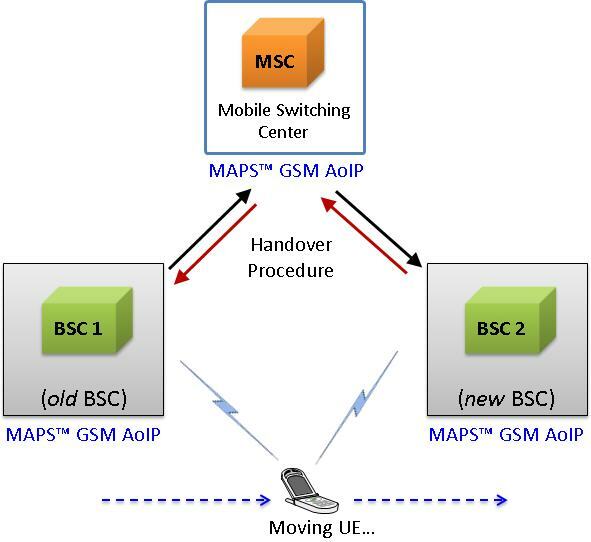 When the user is travelling across two different cell coverage areas, the Handover procedures are initiated from old BSC to new BSC via MSC. These procedures can be simulated using MAPS™ GSMA over IP Emulator. 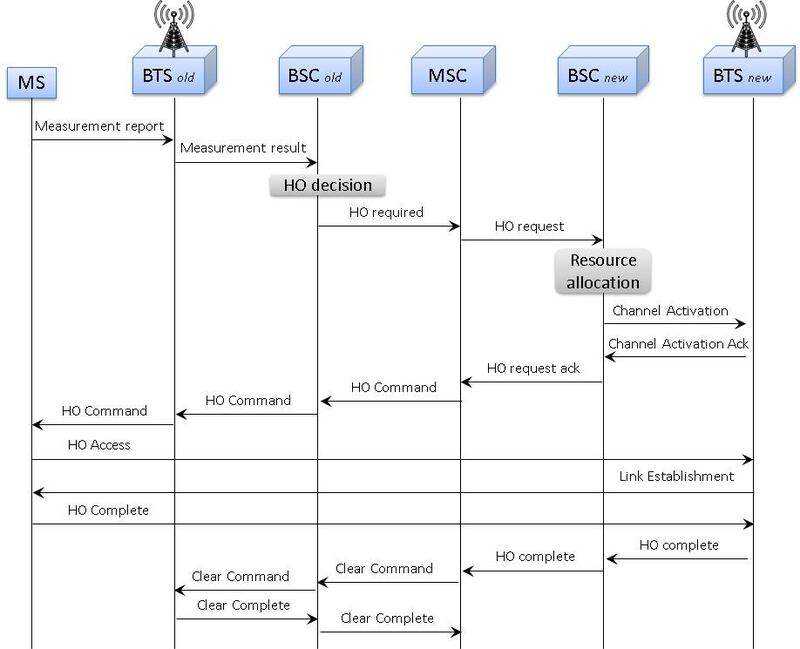 The following screenshot depicts the end-to-end Handover call flow between the old BSC and new BSC via MSC simulated using MAPS™ GSMA over IP Emulator. 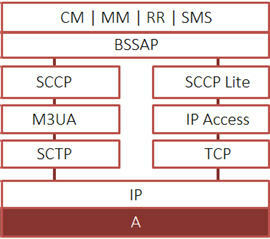 Short Message Service (SMS) is a mechanism of short messages delivery over the mobile networks. It is a store and forward way of transmitting messages to and from mobile phones. The messages (text only) from the sending mobile is stored in a central short message centre (SMC) which then is forwarded to the destination mobile. MAPS™ GSM A acts as Base Station Controller (BSC) and initiates the Mobile Originating Call procedure by sending CM Service Request to the DUT (MSC). The DUT on receipt of a CM SERVICE REQUEST message should send a SMS SUBMIT message in response as shown in the figure below. 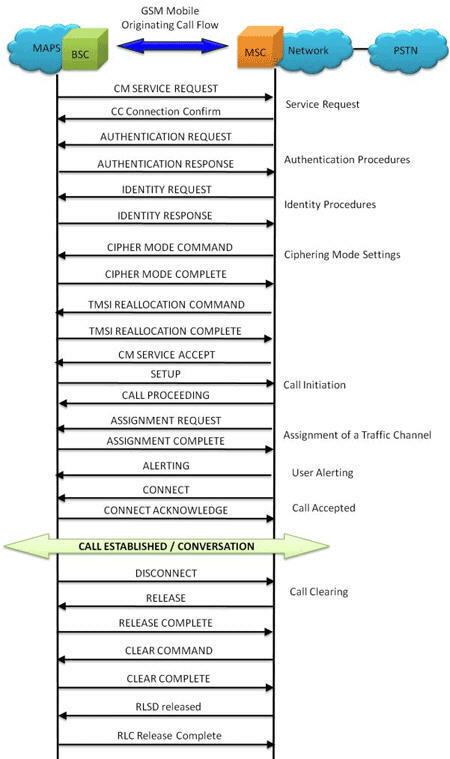 Also, simulates the complete call flow as in typical Mobile Originating SMS Call (MOC) procedure.